Jon started building his strong foundation for dance when he was a teenager. With four years of training in martial arts, he attained the essential core understanding of body movement and balance. He has studied a variety of styles including Ballroom Latin, Swing, Cuban Salsa, Merengue, Modern Dance, Ballet and Flamenco. Jon’s love for Argentine tango music and dance began in his early 20’s. It was then that he decided to dedicate his life to this seductive art form. In 2002, Jon began his career as a tango instructor, choreographer and performer. He was an in-house dance instructor at many well known dance studios in NYC, NJ, Westchester and LI, as well as a guest teacher at various tango festivals in the US and abroad (Japan, Korea, Europe). Jon has performed at venues such as Lincoln Center, the 92nd Street Y and the Star Light Roof Ballroom at the Waldorf Astoria. His television appearances include Fox 5 – Good Day NY, Channel 13 and Channel 17. 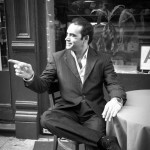 Jon specializes in traditional close embrace; in the styles of Milonguero, Salon and Stage tango. His maestros/maestras are some of the most prominent and well respected Argentinean tango masters of our time. Daniel and Maria, Tete Rusconi (Vals), Omar Vega (Milonga), Carlos Gavito, Nito Garcia, Facundo and Kelly Posadas (Milonga), Elba Garcia and Kelly Posadas (Follower’s Technique). Jon is one of the few teachers who specializes in traditional close embrace, combined with his extensive knowledge in all three dance styles, Tango, Milonga and Vals make him one of the most sought after instructors in NYC. His progressive and fun approach to teaching continues to inspire students of all levels to grow at an accelerated pace. Jon’s philosophy is that technique is the grammar that holds the language of the dance together. His mission – to pass on the in-depth knowledge he has acquired from his many great teachers to his students, contribute to the growth of our local tango community and help preserve the traditions of Argentine Tango.